Refresh your midseason wardrobe with help from local boutiques. It ain’t over ‘til it’s over. While baseball legend Yogi Berra was speaking about a pennant race, he could have been referring to Minnesota winters. February finds us knee deep in the season, and there are still weeks to go until spring pops and wardrobes shed their winter blues. Thankfully, area boutique owners provide their salve to ease whatever ails a winter-weary wardrobe. Spirits aren’t the only things that need a boost during this time of year. The Stash features Democracy jeans ($68). “These jeans lift your backside and pull your tummy in and feel like you are wearing yoga pants,” Summer Jensen, co-owner, says. The Cure’s cut-out earth green top ($34.50) snuggles in under Sunny Love’s coffee-toned, bolero vest ($38.50) with a necklace ($12.50) adding a pop of copper. 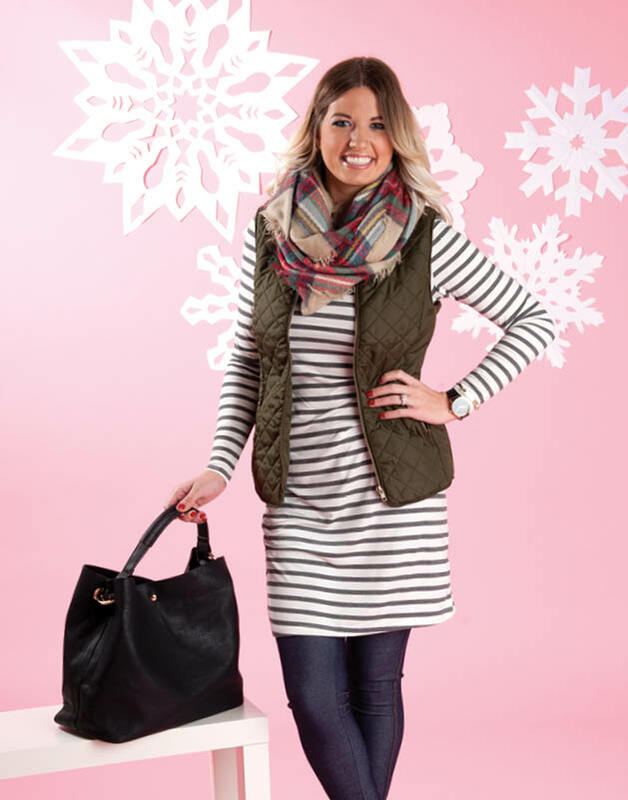 Consider a pocketed, striped shift dress ($44), paired with a puffy winter vest ($44). Add warm jeggings ($30), along with a light-weight plaid scarf ($16) and a large tote ($52) to hold all the essentials. The look is accented with a dainty gold bracelet ($14) and one of Fancy Fab Boutique’s select watches ($26). (Below left) The return of the jumpsuit wasn’t for every body—until now. The Amalli Talli private label V-neck jumpsuit ($150) features a wide-leg design, elastic waistband, front pockets and a back invisible zipper, which is ideal for a wider range of body types. Amalli Talli is a specialty store catering to tall women. “Our mission is to help our customers find and style clothes that fit their bodies to inspire everyday confidence,” Black says. 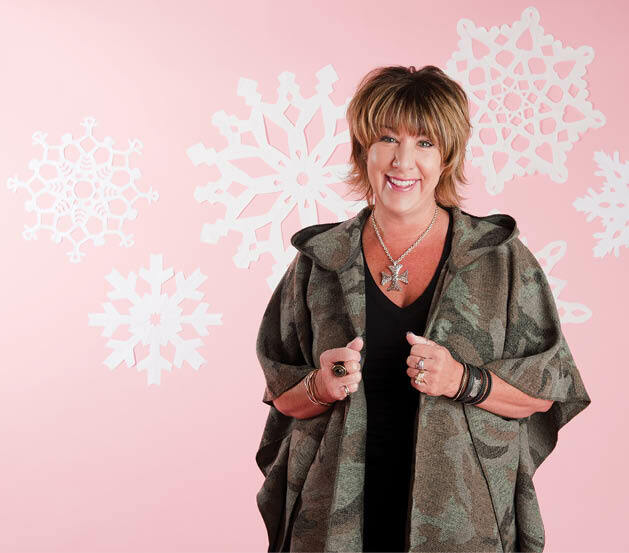 (Above right) Outerwear can run its course, but the staff at Mainstream Boutique offers a way to stay warm and on trend—light-weight ponchos ($30-$45), whose heavier versions have flown off Mainstream’s racks all winter. “They come in a variety of colors and can be very versatile in transition seasons,” owner Dawn Reinke says, who also suggests packing the cloaks for spring break travel. Ponchos allow for ease in layering textures and fabric weights, depending on weather’s mood of the day. The shop strives to help women look and feel good. “We love to empower women,” Mainstream’s Jane Friedman says. The boutique offers fashions and accessories for a wide scope of women. “Whether you are young or young at heart, you will walk away looking and feeling fabulous,” she says.